Plus the dimensions are quite comparable to last year’s Redmi Note 4X, but it has a six-inch LCD panel vs a 5.5-inch last. It is logical to assume that these smartphones must be very different in the rest. 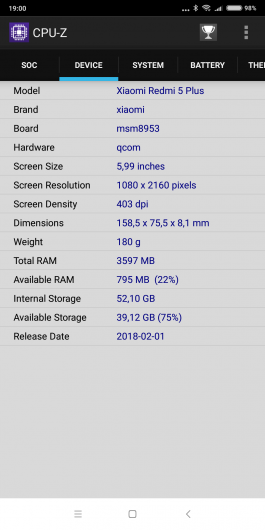 But the differences are not so much: a new contender for the title of best selling smartphone (at least in Russia) are installed in the same platform Qualcomm Snapdragon 625 and offers identical options in terms of memory (3 + GB and 32 4 + 64 GB). But there are some details that are revealed only by close familiarity with the gadget. About them, among other things, we’ll talk. The price for Redmi 5 while perhaps lower than starting from Redmi Note 4X – 10-12 thousand roubles. But first we must clarify a strange situation with the naming of the devices in the family Redmi. Yes, this model bears the name and 5 Note – for different markets provide the same smartphones with different names. Accordingly, it is possible to name an official successor to the Redmi Note 4X, and the younger sister of the newly Redmi Note 5 Pro. Yes, that’s so complicated. Series smartphone Redmi physically can not be of sophisticated design — it contradicts the ideology of the budget of the gadget. Simplicity, quality materials (in this case – glass front panel and metal on the back) – and that’s it. Well, you can still say thank you, that did not copy the iPhone at MWC 2018 imitators “dozens” with a distinctive cutout poured out like a pimple on the face of a teenager. Although in the past to copy the ideas the Apple company, Xiaomi accused all and Sundry. Redmi 5 Plus – just the sleek smartphone, similar to everything and nothing in particular. Individual style is missing, but not ashamed to put on the table – unless of course you don’t want to show off the brand. Although Xiaomi nowadays is too dear mark: if someone is important that you consider practical, is put Redmi 5 Plus a back up, it flaunts the characteristic logo “Mi”. The device is available in packages of four colors: gold (as in our case), rose gold, blue and black. The front panel is in the first three cases is white and the latter black. Dimensions Redmi 5 Plus – 158,5 × 75,5 × 8,1 mm, Weight – 180 grams. Due to the rounded edges that go into the back and flennoy the front panel, the smartphone seems thinner than it actually is. In any case, experience is utter “spade” he doesn’t produce, despite the huge display. But weighs quite a lot – much more than the Redmi Note 4X. To use Redmi 5 Plus comfortable enough – as can ever be comfortable to interact with the device, equipped with a six-inch display. One hand personally I have to do it really does not work, despite almost missing the frame around the screen. However, serious differences from smartphone 5.5-inch display, but with a major part, no. No surprises in terms of layout: two keys (on and volume) on the right edge, the microUSB port and speaker on the bottom, mini-Jack (Yes, he’s on here) on the top. From not quite the usual elements – only IR sensor – Xiaomi loves their “clever house” system and tries to adapt its smartphones under the interaction with the maximum number of components. Under the screen, of course, had no place under the navigation block – it virtual here. The facial recognition system in Redmi 5 Plus set of steel – although this, as we already know very well to a wide range of experience (from OnePlus 5/5T to BQ Aurora) does not necessarily need special sensors and projectors. 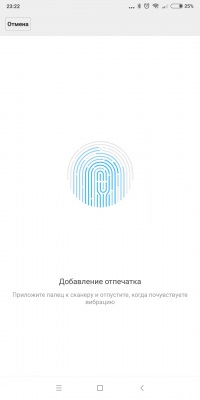 In theory it is possible to expect its occurrence with any firmware, but for now have the old-fashioned way (Yes, you can say so) to use the fingerprint sensor, the capacitive sensor is back in a special recess and at a sufficient distance from the camera lens. 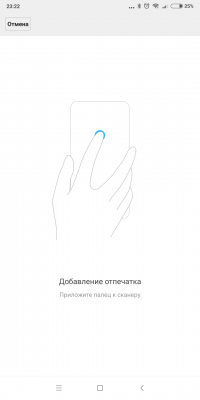 The index finger of that hand which you used to hold your smartphone, naturally falls on this sensor, the interaction of the obtained natural. He works quickly, to overwrite the prints every week is not necessary. 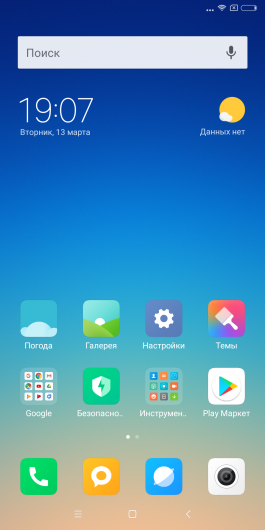 In Redmi 5 Plus the Android operating system 7.1.2 Nougat global c shell MIUI 9. Ever smartphone will be updated to Oreo, but to promise something in the case with Xiaomi still dangerous. Pro shell, nothing much is said – everything is about as usual: the time in the status bar on the left, all other icons on the right, the icons are by default hidden in the squares, but this can be fixed by changing the theme. 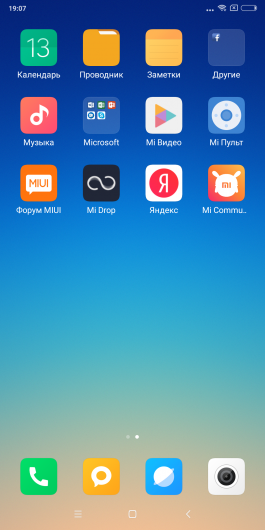 There is a proprietary function, “the second space” and “cloning apps”, which many people love MIUI. General list of apps there – only an endless carousel of screens. 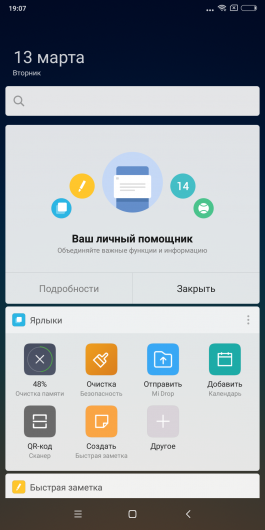 Pre-installed software low – to basic applications, Mi Community, Mi cloud storage Drop, forum Mi and remote to control various appliances in the Russian version-added services “Yandex”. In principle, all very unobtrusive, neat and fast. But there are nuances. First, the same line with the navigation keys. It is very small, resulting in a positive impact on the size of the working space of the screen, but negatively to precision control, especially with one hand – the icons don’t have enough size. Secondly, stable performance. Alas, here are 5 Redmi Plus does not Shine. 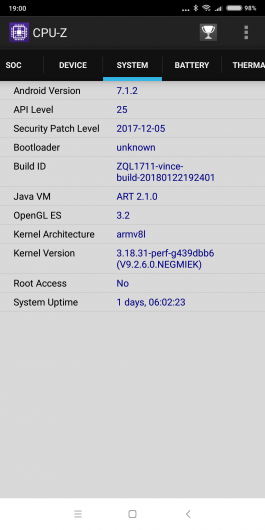 If the first week I didn’t any problems, starting with the second relatively regular flights from a wide variety of applications, memory leaks, issues with the Wi-Fi connection (cellular networks this smartphone worked smoothly) and even a couple of spontaneous reboots – without any special reason like overheating. Nothing catastrophic, to use with you, but to talk about wonderful user experience does not work at all desire. In Redmi 5 Plus is a six-inch LCD screen with IPS matrix a diagonal of 6.0 inches and a resolution of Full HD with the amendment to the long format (2160 × 1080 pixels). The pixel density is 403 ppi. 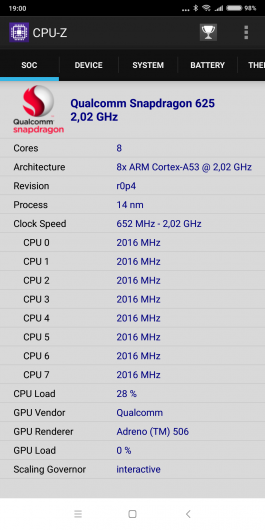 This is the usual standard for smartphones of this level is quite comfortable to use, but not too taxing hardware and battery. Viewing angles are normal, with a strong deviation of gaze from the perpendicular decreases the contrast but do not distort color. The oleophobic coating is beautiful, that Xiaomi is famous for is to slap the screen is not as easy to scrub but, on the contrary, easily. Touch capacitive layer, with support for 10 simultaneous touches. The brightness is sufficient – 531 CD/m2. This is a great level, although I would not say that in the bright sun to use Redmi 5 Plus very comfortable – the picture still fades, you have to look at even when set at maximum brightness. Although the air gap between the matrix and the glass here, of course, is not, and a polarizing layer, in turn, is. The measured contrast is impressive, too – 1534:1. I would not say that the screen can argue that in contrast to OLED or (remember) plasma, but almost any competitor on the depth of the black new Redmi with ease shut up for the belt. Is the average gamma of 2.29 is within permissible limits, although the curves, as can be seen on the chart, “dance” in bright colors. However, this behavior is usual for displays of inexpensive smartphones. The color temperature is much too high – ranges from 7 500 To 9 500 K. It will taste just avid fans of cool colors. Color gamut is slightly wider than the standard sRGB. The average DeltaE deviation for the extended Color Checker palette (shades of gray + a wide variety of colour shades) is 5.35 at the maximum allowable rate of 3. And all these figures are obtained when disabling auto-correction and contrast when set to “natural” color tone. You can force activate the “warm” colors or choose even more cool shades. To get pictures of the ultimate naturalness to smartphone displays color as intended by the author of the image/video will not work, but to adjust the color to fit your preferences. 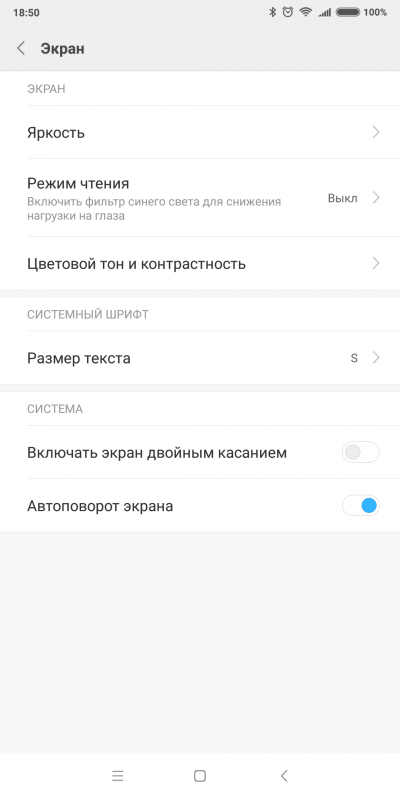 Redmi 5 Plus mediocre sound via headphones – with enough power on the street and in transport not to put the volume to maximum, but the frequency spectrum is shifted towards the “bottom”, the music eventually mutters. Monaural speaker hidden under the right of grids located on either side of the microUSB connector. It does not overlap with your finger when you touch the grip. The volume is not very high, in a noisy place, there is a risk to miss a call.